The Old State House is the oldest surviving public building in Boston, and was built in 1713 to house the government offices of the Massachusetts Bay Colony. As the center of civic, political, and business life, the Old State House was a natural meeting place for the exchange of economic and local news. A merchant’s exchange occupied the first floor, and John Hancock and others rented warehouse space in the basement. The National Historic Sites Commission has called the Old State House one of the most important public buildings in Colonial America. Explore the site of the Boston Massacre, where five men lost their lives. Relive the moment in July 1776 when the Declaration of Independence was first read to the people of Boston. For more information visit bostonhistory.org. The Hampshire House is a turn-of-the-century mansion on historic Beacon Hill, where generations of Bostonians and their guests have wined, dined, and danced the night away. Designed and built in 1910 by the society architect, Ogden Codman, for fellow Brahmins Bayard and Ruth Thayer, the five story Georgian revival townhouse was lavished with Italian marble, carved oak paneling, crystal chandeliers and tall Palladian windows. Those windows not only looked out onto the Victorian elegance of the Boston Public Garden, but they also looked into the social world of Boston’s elite, as 84 Beacon Street became one of the most fashionable salons in the city. Thomas A. Kershaw has been the owner of the Hampshire House since 1969. Since then, the Hampshire House has been the ideal choice for special occasions. Its interior decor gives an aura of those grand days when the Thayer’s entertained in their magnificent mansion on Beacon Hill. Now you, too, can be a part of history at the Hampshire House. Located in the heart of the Theater District, the Boston Opera House hosts top touring Broadway shows, Boston Ballet performances and other high-quality cultural presentations and concerts. The Tony Award winning musical “Wicked” is at the Boston Opera House from June 7th to July 23rd. For more information and tickets please visit bostonoperahouse.com. See where the Boston Tea Party began in 1773. Come inside one of the nation’s most important colonial landmarks to experience the place that changed American history forever. The Old South Meeting House still stands in the heart of bustling downtown Boston today, open to the public daily as a historic site, museum and an active gathering place for discussion and celebration. The Old South Meeting House was the favorite stage in Boston’s drama of revolution, the place where colonists gathered time after time to challenge British rule in the years leading to the American Revolution. It is the place where unprecedented numbers of people from all walks of life engaged in debate and dialogue that would change the fate of a nation. For more info visit osmh.org. The Bull & Finch went on to become one of Boston’s must-visit attractions. However, even with all that stardom, the bar now known as Cheers has held onto the feelings of hospitality and warmth felt by the writers over 25 years ago. In 2001, Kershaw opened Cheers Faneuil Hall as a replica of the one seen on television. Cheers is the ideal place for newcomers and old friends alike to share hearty laughs, tall tales, “little-known facts,” and, of course, a cold beer. On June 1, 1986, 4,000 people came together at an event called “From All Walks of Life,” a fundraising walk to support the services of AIDS Action Committee. Today, this event is known as the AIDS Walk & Run Boston. More than thirty years later, almost 350,000 people have participated in the AIDS Walk & Run Boston and raised over $40 million for the programs and services of AIDS Action. The Boston Common, founded in 1634, is the oldest public park in America. From Colonial times to the present day, the Common has been at the center stage of American history. It has witnessed executions, sermons, protests, and celebrations, and it has hosted famous visitors from Generals Washington and Lafayette to Reverend Martin Luther King Jr. and Pope John Paul II. Today, the Common is the scene of sports, protests, and events large and small. Yet for all its adaptation to modern life, the Common remains a green retreat remindful of its storied past. The first public botanical garden in America, its form, plantings, and statuary evoke its Victorian heritage. This green and flowering oasis in the heart of a great metropolis has become a Boston icon. Observing the Garden on a peaceful summer’s day with the trees in leaf, the flower beds bright with color, and the Swan Boats tracing their tranquil course around the serpentine pond, you would never think of it as a civic battleground. In the early days, some complained that the unnatural combinations of colorful plants were garish beyond the bounds of good taste. Now Boston calls the Public Garden one of its greatest attractions. 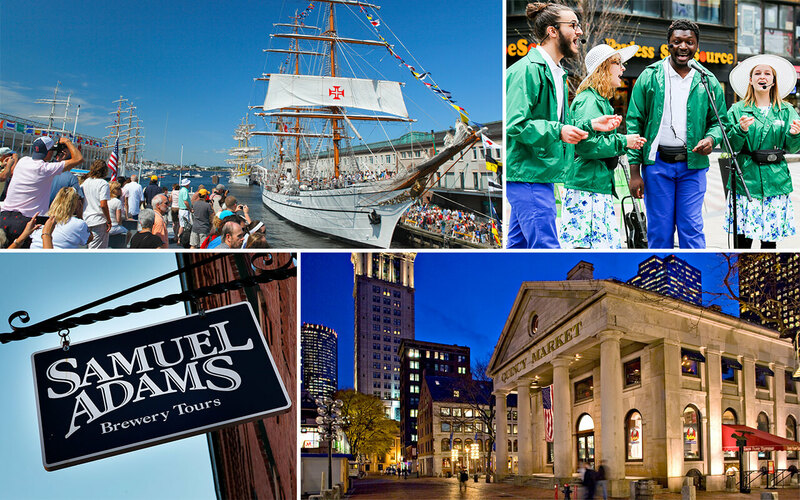 Established in 1660, some of America’s most notable citizens rest here, including Sam Adams and Paul Revere. Named for the 12,000-bushel grain storage building that was once next door, the historic cemetery has 2,300 markers. However, there is a discrepancy between the number of headstones and the number of people buried on the site, which is said to be 5,000. Visit Salem, Massachusetts this summer and you can learn about the Salem Witch Trials of 1692, explore sea captains’ homes, and experience “Ocean Liners: Glamour, Speed, and Style” at the Peabody Essex Museum. Create your adventure at salem.org. Well of course we had to include ourselves! Boston is an official port of the Rendez-Vous 2017 Tall Ships Regatta, and we are welcoming over 50 Tall Ships into the harbor! Learn about personal experiences from cadets and crew members, grab dinner at one of our featured restaurants, and enjoy many activities throughout the city! This is a free, family event taking place from June 17 – 22! Click here to view the full schedule of events. Sail Boston will host a sanctioned hot dog eating contest on Sunday, June 18, 2017, to qualify the champions who will compete in the 2017 Nathan’s Famous Fourth of July International Hot Dog Eating Contest. The top male and top female finishers from this qualifier will be invited to compete at the ESPN-televised finals at the original Nathan’s Famous in Coney Island on July 4, 2017. The Steps are a new feature to the Downtown Crossing area, having been built in 2016. The Steps are stadium-like seating atop the MBTA’s Downtown Crossing station on Franklin Street. A clock tower also hosts interactive informational touch screens. The Downtown Boston Business Improvement District sponsors live musical performances, demonstrations, talks and more every day on the stage in front of The Steps from noon – 2:00 PM and 4:30 – 6:30 PM. This is a great place to sit down, relax and enjoy a bite to eat outdoors. Join The Trustees, Old North Church & Historic Site, and The Fireplace for a culinary adventure you’ll not soon forget! Get a taste (literally!) of what life at sea was like during colonial times. Let Chef Jim Solomon of The Fireplace teach you about nautical cuisine… and discover the difference between what captains ate and what sailors ate by sampling two distinct menus. Participants will leave with a greater understanding of the dietary aspect of Boston’s history and class distinctions on board a ship. See the menu and get your tickets on eventbrite.com! Want to see a movie? The AMC Loews Boston Common theater has 19 screens offering an array of movies. This is a great place to get out of the heat, or away from a rainy day, or if you just want to watch the latest blockbuster. Visit amctheatres.com for more info on movies and showtimes.